The French Wine Scholar is the official curriculum for French wine as endorsed by Wines of France and the French National Wine Office. It was developed by the French Wine Society to provide current, accurate information on the wines and regions of France. Intermediate to advanced students of wine who follow this in-depth curriculum and pass the exam will earn the French Wine Scholar (FWS) post-nominal. Those who pass the exam also receive a certificate and lapel pin. The exam consists of 100 multiple-choice questions regarding all French wine regions. The French Wine Scholar (FWS) credential will be conferred to those individuals who achieve a score of 75 or higher. 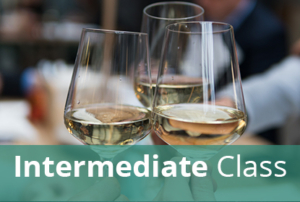 The course includes 8 classes (Each class focuses on one of the following regions: Alsace, Champagne, Burgundy, Beaujolais, Loire Valley, Bordeaux, Rhone, South of France — a total of 16 hours of instruction with tutored tastings of 6-8 wines, each class is 2 & 1/2 hours). Please note that membership in the French Wine Society is not included in this program. Students interested in becoming members of the French Wine Society should visit www.frenchwinesociety.org. Register before August 5 and save $100! REGISTRATION FOR THIS COURSE WILL REMAIN OPEN UNTIL THE COURSE START DATE, BUT REGISTRANTS AFTER SEPTEMBER 2 WILL NOT RECEIVE THEIR STUDY MANUAL UNTIL THE SECOND CLASS.